For Real This Time: Show Barnes & Noble that Power Pivot and Power BI are Important! Sunday, Feb 7th in a Local B&N: That Silver/Grey Spined Book is Ours! OK, for real, B&N has them now! (I have seen them myself, as pictured above, and every B&N I’ve called has them). Remember, they accepted our challenge of an experiment: they will stock our new book for a few weeks and see what kind of “action” it gets. If it does decent sales, they will keep the book on the shelves (AND start stocking more such books, which is just as important IMO, because people scanning the Excel section of a bookstore is one way that the word gets out about these toolsets). ***Important: Ask for it by ISBN Number, Not Title! If you ask for it by title, they might tell you they don’t have it, even though they DO! (Long story, but they have the title of the 1st edition linked to the new ISBN, but with the new book’s cover… it’s pretty funny). That’s what you should ask them for on the phone, or at their in-store helpdesk. Don’t even mention the title or authors. About half the stores we called had the book, but had NOT yet placed it on shelves – they still had it sitting in the storeroom in the back. Mail the physical receipt to the address below. I have a copy on reserve and will pick it up after work this afternoon. Going to give the copy to the office along with the free book. Michael got one at one store in Overland Park, but it was not available at another store. 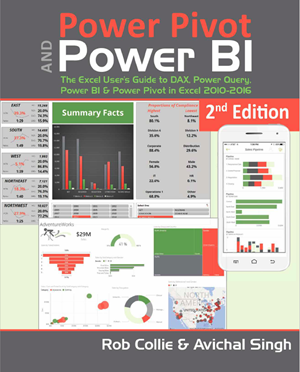 However, he did bring a copy to our Power BI & Excel Power Pivot-Kansas City group and we announced the promotion! Good to know! I went to 3 different Barnes & Noble looking for your book. I have it downloaded on my iPad but it’s not the same — I still like to HOLD my books and newspapers! This is a great initiative Rob and Bill. I actually think this is one of the most important marketing campaigns to date (Ie the availability push). I have never ever entered a physical book store without going to the Excel section, so I am sure I would have discovered Power Pivot sooner if there had been nooks on the shelf. I can’t be the only Excel book nerd. Went to the B&N in Covington, KY. Did not have it in stock. Put it on order. Big store but a small Excel section, part of one shelf. Ted, thanks so much for taking that trek. Friends, really appreciate all your support. Before going in you can also try calling your B&N and asking about the ISBN. They should be able to confirm if it’s in stock and even order one to be picked up in store if it isn’t – may save you a trip. Bought my copy in Grand Rapids at Woodland Mall. Only time I go to Barnes and Noble is to buy Excel books. The Barnes and Noble website seems to be designed to push the Nook version of the book instead of the physical book. A search for Power Pivot yields results including Rob and Avi’s book, but when you click on the book as listed, only the Nook option is evident. If you enter the ISBN number Rob shared into the search bar within the website ( 978-1615470396 ), B&N gives you the option to click on a link called “Available for Pick Up In Store”. A click on this link leads to a search by zip code. The book is available ALL over the Pittsburgh area. 2 copies in Eugene right next to M is for Monkey. Fantastic! Love seeing that there are a few other killer titles in that bookshelf picture as well! I searched the B&N website with the ISBN number to confirm a couple stores with the book in stock. Stopped by a store mid-day today, but the book was damaged. I inquired if another copy was in stock, but alas, no more were available. The book wanted a little air, so I returned it to the shelf with the cover showing. I took pictures of the book as originally displayed and later with the beautiful cover showing. Stopped by another store after work, but I could not find the book anywhere. I provided the ISBN number, and the clerk stated that the book was on hold for another customer – a GREAT sign. The clerk knows that they lost a sale because they had an insufficient number of the books available. Went to my local B&N this morning. The book was not out on the shelf, had to ask Help Desk to look it up. Books are still in the back room. Bought a copy (this will be my 3rd…it’s SO GOOD I hold one in each hand and the 3rd with my left foot) and the rep said they will get it out on the shelf. Alas, no picture here. Managed the trek to the best technical bookstore (took a while as I was waiting for a record breaking heat wave to pass) here in the most isolated city in the world. No book on the shelf sadly but being the brilliant bookstore they are they asked immediately if I would like them to order it in. I didn’t get them too as I already have the book but good news my new workplace is jumping all over me after having given them a taste of Power Pivot in my first month here. There is a very high likelihood that an order or ten will be heading down this way. It was a surprisingly bare section with only two books mentioning Power Pivot (both by the Italians) I guess we are a little bit out of the loop! Will send through a very sad looking pic. Chris, really appreciate you taking the trek. Too bad the book wasn’t available. I personally don’t usually walk into bookstores. But I know some people still do. And for those Excel users, we want them to be stumbling on to Power Pivot (through our book or someone else’s). So we are hoping it sticks around and spreads to more bookstores. Glad to hear you are spreading the “benevolent virus” of Power BI at your new Org. Keep up the good work. Viva la Revolución! In Pittsburgh, PA I went to one of the B&Ns on Wed 2/10, nothing on the shelf because someone had already had the one copy held on reserve…maybe it was Michael above, boo! 😉 So I bought a copy from B&N to be shipped to me directly…hoping that transaction will register with them that we need more of them in Pittsburgh. Book arrived yesterday. Very excited to crack it open today. Bought it on Friday at B&N in midtown NYC. Great read so far. Bummed that I forgot to take a snapshot at the store, but picked up my copy at one of the B&N in Columbus, Ohio. I’m an owner of the first edition, but excited to see what’s new and improved! Friday I went to the B&N at Rivertown Mall, Grandville, MI. They had one copy, located with the other Excel books (I took a picture). I would have purchased the book, but the back cover had a tear in it. I asked if they would discount it – they said “No”. I asked if they had another in the back – they said “No”. So, I walked out. 🙁 Very disappointed in B&N – this is why Amazon is so successful. I hope to buy thru Mr Excel website. Found one copy at the Fullerton CA B&N! Enjoying it so far. This book is excellent! I am now a true believer. I will not be using Access any longer to extract data and build reports. Page 227 solved the nagging M2M problem for me and has allowed me to query a 13 table relational database in seconds using any possible criteria. An Excel Pro’s life can be divided into two distinct periods: before and after PowerPivot. Bravo! Picked up my copy last weekend and am now looking forward to the time I can devote to it! It took 3 tries but I finally found on in the store. Never would have found it without looking up the ISBN above even when store employees look up the book it does only promote the eReader version. The Central Missouri store did have it on order last week and re-visiting the Independence MO store and getting a second set of eyes to help search the shelf, I found my copy. Think this is a awesome awareness campaign. Thanks you Rob and Bill, and Avi too. I can confirm Avi’s comment on the back cover that “Rob tricked him into it” has I got to observe him working on chapters in person over any free time during his training visit last summer. Its really awesome to see your efforts paying off. You guys are amazing. Just picked up my copy from the Vancouver WA B&N, haven’t purchased a paper book in quite a while, looking forward to reading it. Thanks for the heads upon this site, would have never found it. I just got mine!! 2/4… uh, 2017. I’m guessing it’s too late for a freebie?? previous post: Show Barnes & Noble that Power Pivot is a Monster!